Posted on Tuesday, July 16th, 2013 at 12:39 am. This Discover Cooking with California Olive Oil Recipe Contest submission comes from Jody Gilmyers of We Olive Walnut Creek. 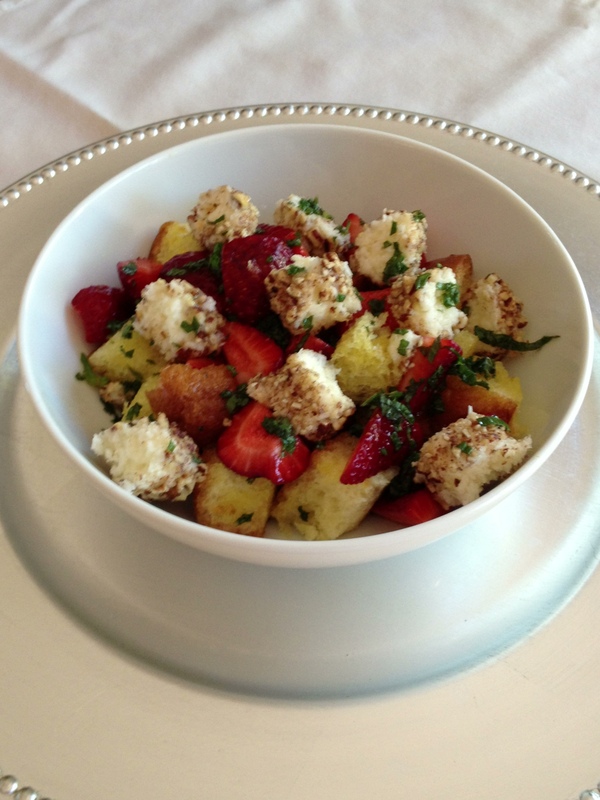 Her Dessert Panzanella is a sweet rendition on the classic Italian bread salad. 1. Mix peach vinegar, honey, and mint in a small bowl. Set aside to allow mint to infuse the liquids. 2. Drizzle lemon olive oil over brioche cubes. Toss to coat. Divide between two serving bowls. 3. Mix mascarpone, coconut, and honey until well combined. Form mixture into a 10″-long log using plastic wrap. Roll the log in crushed pecans. Wrap log tightly in plastic wrap and freeze for 20 minutes. After removing from the freezer, unwrap log and cut into 20 pieces. 4. To assemble the dessert, top each bowl of bread with a 1/2 cup of strawberries, place 10 cheese-log pieces on top of the strawberries, then pour half of the vinegar/honey/mint syrup over the contents of each bowl. Add a pinch of salt over each bowl. 5. Allow dessert to rest for 20 minutes to allow bread to soak up syrup and cheese to come to room temperature. Note: Unlike traditional panzanella in which all ingredients are tossed with the dressing, tossing is not recommended for this recipe as it may cause the brioche and cheese to fall apart.